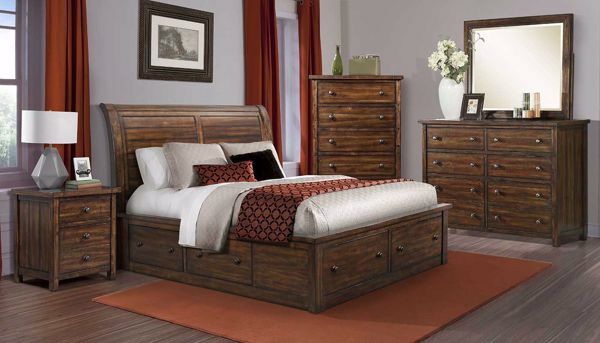 Our Dawson Creek Sleigh Storage rustic bedroom collection features a sultry semi-gloss, deep chestnut lacquer finish. 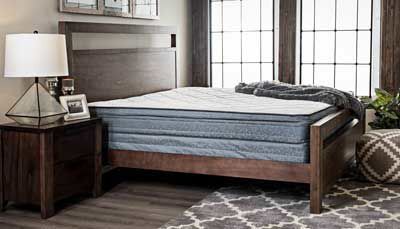 Made from solid and select veneer Acacia wood.This carefully crafted set features clean lines throughout, sturdy panels in the headboard, extra storage in the rails and footboard, as well as brass metal knobs to compliment this warm and cozy look. Spacious drawers in the case pieces and a three drawer night stand make it easy to stay organized while the overhanging apron tops add a touch of sophistication to this ever charming bedroom group. The Drawers feature dovetail construction for added strength and upgraded ball bearing glides for ease of use. Chest sold separately.